Are you looking for the way to install custom themes and visual styles in Windows 10? Don’t worry! I am going to cover the complete method on how to install Windows 10 custom themes on your computer. Windows operating systems have always been fairly customizable. One can easily customize the desktop or lock screen wallpaper, mouse pointer, visual style and much more like this. The latest version of Windows 10 has more features in terms of the modification. You can easily reconstruct the visuals of your computer. But, one thing is missing; that is custom themes. You can’t install a third-party or custom theme, which can easily transform the Windows 10 look. As like Android, the theme is one of the best inventions to transform your visuals. 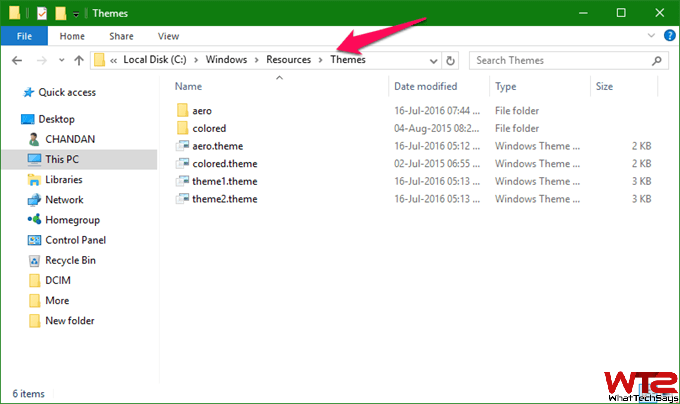 Microsoft provides a limited amount themes on Windows 10. Obviously, you can download more from its store, but not everyone would like to use these free themes. As I seen, most of the themes available on the Microsoft’s store are based on the stock visuals. The only difference you get is the wallpaper. Microsoft doesn’t allow to install custom themes in Windows 10. You can only install the themes or visuals which have been digitally signed by Microsoft, or simply the ones that are offered officially by Microsoft. The reason behind this restriction is, if you install third-party themes in Windows 10 from an unknown source, then your computer might get infected with virus or malware. But, if you know the place where you can download virus free themes, then you can proceed further. You need a custom theme to install in Windows 10. Don’t worry! I have mentioned the best source to get custom themes at the end of the post. As I said before, Windows 10 doesn’t allow you to install third-party themes. So, you have to “unlock” that functionality first to proceed further. It can be done using many third-party patching tools available free on the Internet. Some of the popular tools are UltraUXThemePatcher, UxStyle, and UXTheme Multi-Patcher. If one tool doesn’t work for you, then you can try other tools also. 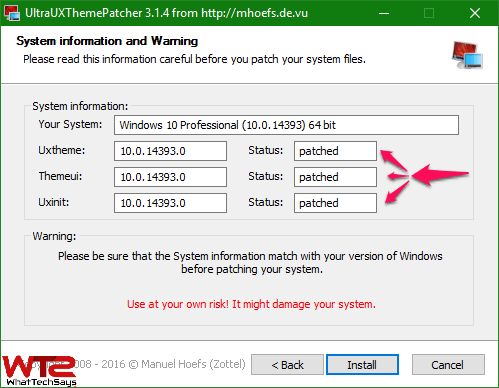 Basically, these tools help you to patch the system files which are responsible for Windows 10 theme support and remove the restriction. You can easily unlock the functionality by using one of these tools. The best part of these tools is, you don’t need any extra skill to use them. The patching procedure is simple and straightforward. This tutorial has been tested with UltraUXThemePatcher. Simply download the utility and run it with administrator rights. After that, click on the Install button and Reboot your system. Now you are ready to go for Windows 10 custom theme installation. The theme installation process is not similar as for how you install a program on your computer. Every custom theme file you have download comes with the instruction, because every theme has its own sounds, visuals, and graphics. Well, there is a common procedure to install the basic third-party themes. Basically, a custom theme file contains two things; one file with .theme extension and a folder with numerous files. You just need to copy and paste these two things on the below location. After that, there are two ways that you can activate that theme. Just double-click on the .theme file or directly apply it from the desktop properties. That’s it. As like this you can download beautiful visual styles and themes and install them on your Windows computer. The best place to get started for custom themes is DeviantArt. This is the most popular website for this category. It has a broad range of custom themes offered, and these can not only remodel Windows 10 entirely but can even make it look like other Operating Systems. This is the tutorial on how to install custom themes and visual styles in Windows. Don’t forget to read the given instruction on the theme file before applied. If you have any question regarding how to install Windows custom themes, then feel free to mention below.